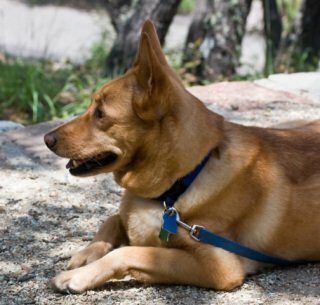 If you have plans to go hiking with dogs, there are a few necessities to consider. Here are 6 dog hiking gear essentials so you and your dog will be well prepared for a good hike. Regardless of who you're hiking with, even if you're by yourself, you should have some sort of first aid prepared in case something goes wrong. It's especially important, however, not to forget the first aid when you have the dog along with you. It may also be a good idea to take first aid classes, such as the ones offered by Red Cross and Petco. For safety, carry a reliable first aid kit and a light weight book with instructions explaining what to do in case something goes wrong. Though your dog may feel uncomfortable with foot protection, it's an important precaution to take to protect your pup's feet. The best option would probably be a good pair of dog hiking boots like Ultra Paws Rugged Dog Boots, but if your dog can't or won't walk in them, paw wax like Musher's Secret should do the trick. This almost sounds like a no brainer, but hydration is crucial to an active dog. Be sure to pack plenty of water along with a collapsible bowl like the Bamboo Silicone Pop-Up Travel Bowl for your dog to drink from, or a good dog pack with a built in hydration system like the Ruffwear Singletrack Pack. With dog packs, your dog should be able to carry his own food and water (depending on his size) without much of an issue, both are important to keep along to keep your dog happy and healthy during the hike. Along with foot protection, protective clothing can be a good idea depending on the type of dog you have and the time of year you're hiking. As mentioned above, your dog will need a reliable dog pack. 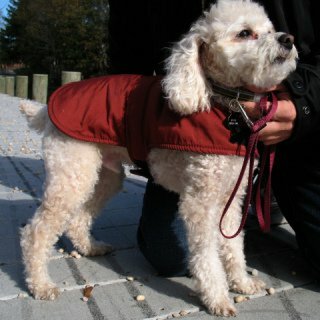 During the winter or the cold season, most dogs will also need a reliable dog coat or vest. For more information about buying a reliable dog coat, try reading How To Choose A Winter Coat For Your Dog. It's also important to bring a leash to keep your dog safe and by your side. When hiking, it's best to be cautious. Not only should you not leave any trash lying around, but it may also be a good idea to take some waste bags with you to pick up any waste your dog leaves. Double bag the waste, or follow LNT (Leave No Trace) regulations and bury the waste away from the trail and any water sources. In case anything happens on the trail or your dog gets lost, it's important to equip him with the proper identification. Bring a recent picture of the dog along with you, and make sure he has tags engraved with his name and a phone number. It may also be a good idea to have a vet equip him with an identification microchip. If you decide to camp with the dog as well, he'll need a good sleeping bag of his own or a foam bad and a warm blanket or two. At night, it's a good idea to equip the pup with an LED light or glow stick bracelets and collars. Any other hiking necessities you can think of? Feel free to tell us in the comments! Check Out This Trio Of Healthy Dog Treat Brands!